YoYo Games have launched a summer sale offering significant discounts on a variety of products. GameMaker Studio Professional is 40% off and available for only $60, and a new featured deal is being offered each week. Check out the latest deals below. Sale ends 5th-6th August 2014. The deals will change on a regular basis and YoYo Games promise “some surprises along the way”. We’ll update this page as the deals change. And that’s it! We hope you got a good deal in this year’s GameMaker Summer Sale. 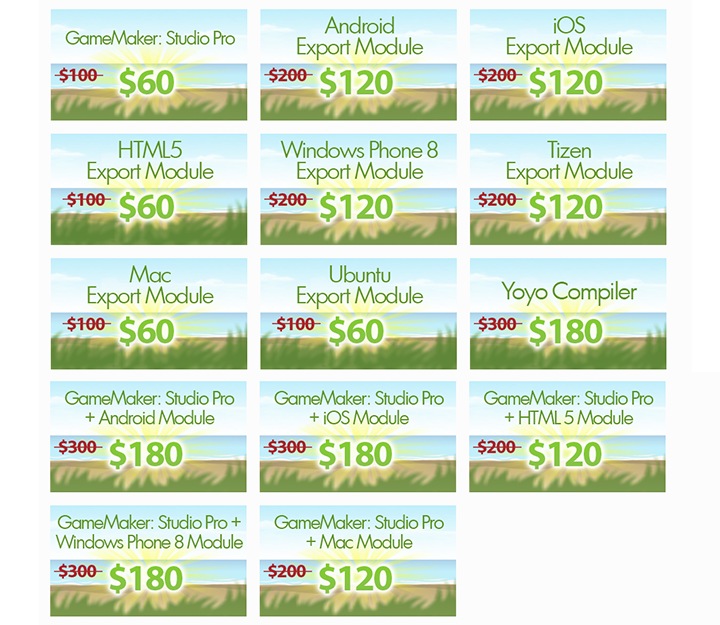 There all on sale, because gamemaker 2.0 is coming out. They fail to brag about that. You’ll be stuck with 1.0. They lied to me and said “lifetime license” then they changed their website recently now saying “lifetime license for 1.0”. I understand completely! Construct 2 is both cheaper, AND easier to use. All “export modules” are completely free after paying the program’s base price of about $80. Of course the bullies running the Game Maker forum try to censor anyone who points stuff like that out due to it being “competition”. Rather than trying to censor it, they should use such ideas to actually try and improve Game Maker! Effing tyrants! Week 3 promotions have been added. Week 2 promotions have been added. If the week ends the promotio ends as well ? should i wait for any of the other weeks? Your face must be swelling from all the slap from Steam sale then. The Master Collection is still a better deal because it’s still cheaper and you get all future modules. If you bought all products at full price, it would cost you $1500. With 40% discount, it costs $900. If you bought all modules for $400 instead of $480 (4 x $120) in the first week then all products would cost you $820. That’s still more expensive than the $800 Master Collection and if they release more modules then you have to buy them instead of getting them free. Extra modules could be Firefox OS and Ubuntu Touch, which are both mobile operating systems, so $200 each like iOS, Android, Windows Phone 8 and Tizen. I agree, except that Construct 2 costs $80, and once you have bought it, it includes all current and future modules for FREE. Game Maker costs TEN TIMES that for the same thing. What are its creators thinking? !